Oh yes my non-sewing friends it is possible! 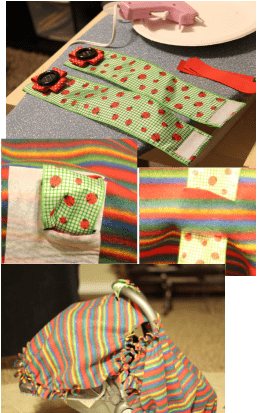 You too can make a cute baby car seat cover, without having to sew a stitch! Please note that there are two versions of the no sew baby car seat canopy pattern. 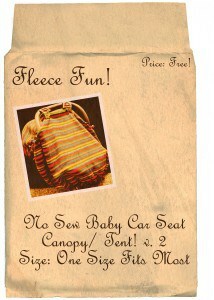 A printed out version of the Free Fleece Fun Baby Car Seat Canopy PDF. Assemble the pattern. You can find assembly directions on this page. Please note there are two versions of this pattern. There is a picture in the download as a reference guide. Placing the line on the fold pin and cut out the pattern. 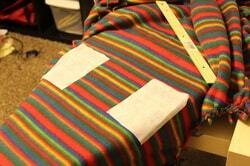 Then trim off the “fringe zone” section of the pattern and pin back onto cloth as pictured below. Tracing the pattern draw a line all the way around it. This is your reference line. One the wrong side of the cloth mark the four corners of where the interfacing will go and the slits will go on each side. If you want you can skip this step and just leave the pattern on the cloth and go to step four. Cutting to the line or outside of the pattern, snip the fringe. I like it between a half-inch and an inch wide between cuts. It doesn’t have to be perfect, just try to keep the cuts straight. Snip all the way around the pattern. Tip: The placement of these are approximate, all baby car seats are different. 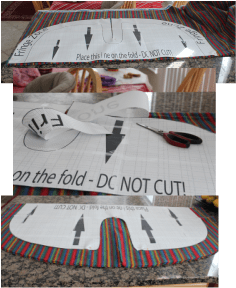 If you have access to the car seat you are making this for I suggest you sit the fabric on it to get the placement just right. I like to do this while watching a movie. Tie each individual strand in a half knot. Go all the way around the blanket. You will notice that the edge gathers a little – it’s supposed to. It helps fit a little more snugly on the car seat. Cut two strands of ribbon into 10 inch lengths. Finish the ends with a lighter. Turn over each end 1 inch once and then 1 inch again (folding in toward the wrong side of the ribbon. 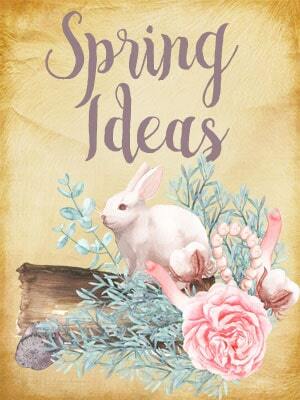 Note: I used wire ribbon and it worked great! Iron on the hook side to the wrong side of the ribbon. Place it over where you turned under the ribbon so it will hold down the fold. Iron on using a press cloth to protect the ribbon. 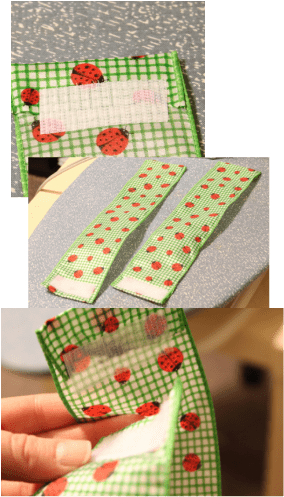 Place the loop on the right side of the ribbon and iron on using a press cloth. You should now be able make a circle when you attach the Velcro. Using a hot glue gun secure the other end of the ribbon that you folded in. Glue on any accessories you would like to add to the front of the straps (on the right side of the ribbon) – I like buttons and ribbon.Tutorial here. Cut the slits in the fleece that you marked. 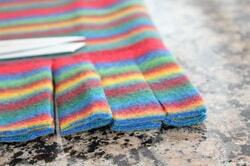 Slits should only be half and inch wide – the ribbon will scrunch and the fleece will stretch. A small slit is better in this case. Thread the straps through and put on the car seat. 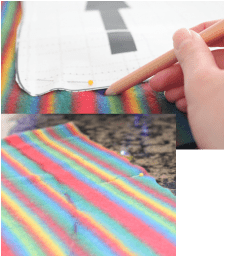 The pattern is designed to envelope over the baby – you can tie the fringe on each side together so there aren’t any gaps on the side.Note: If you don’t want to tie the sides together, you could also use some iron on Velcro. You could easily make this a double layered cover (great for cold climates) and just tie the two layers together, and thread the straps through both. 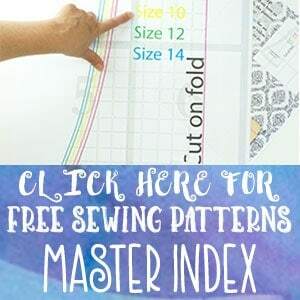 If you don’t like how this pattern curves in on the sides there is a second variation of the pattern available on this page. This is a really nice , simple pattern, thank you for sharing. the stips on the corners won’t be perfectly straight, they’ll be a wedge shape. Hi Sara! Congrats on your coming little one. I am sorry but I don’t have plans to post such a pattern at this time.